RF drive amplifier for FAIMS setups released! NEW Cryogenic Super Low Noise Amplifier released! NEW Broadband Cryogenic Buffer Amplifier released! NEW fast HV switch released! NEW RF Generator for Ion Traps released! Improved version of HF-D series released! Unipolar multichannel high voltage DC source HV 2000 available NOW! Improved Dual Cryogenic Ultra Low Noise RF-Amplifier HFC 50 available NOW! Cryogenic CMOS Buffer Amplifier available NOW! We offer a variety of non-destructive electronic detection systems for Ion Traps. They allow you to perform a medium-resolution (axial detection) or a high-resolution (FT-ICR-Detection) analysis of particles. These detection systems can be provided custom specific or as standard modules, sensitivity up to Single Ion Detection is feasible. Using of novel phase sensitive spin detection technique in conjuction with our custom modules allows measurement on single heavy ions and protons. The FD 1-40 is intended for downconverion of ion signals from the MHz-range (1 to 40MHz) down to the LF (low frequency) range of 0...40kHz. 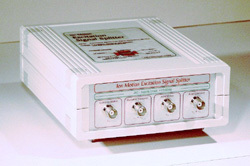 It is a multichannel device, which has 2 inputs and 8 output channels. Contact us! We are looking forward to discuss the applicability of one of these detection systems with you.